Are you getting as much quality traffic to your site as you’d like? In this episode, find out why content marketing should be part of your traffic strategy and how to go about it for maximum benefit to your business. 02:11 – Think it’s difficult? James Schramko here, welcome to SuperFastBusiness.com. I hope you enjoy these short podcasts where I give you actionable information, so that you can go out there and get results in your business. 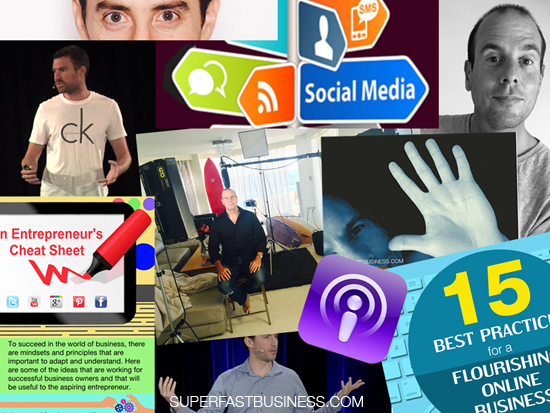 If you like these podcasts, you might also like to join SuperFastBusiness membership, where I coach you and help you grow your business to make it more profitable in a shorter amount of time. Today’s episode is about why content marketing is a powerful traffic strategy. You’ve probably already realized this because you’re listening to this podcast, and I’m going to help you maximise the traffic that comes to your website. A simple model is looking for offers that you can convert and make a profit on, and then drive as much traffic as you can to those offers. But it has to be the relevant traffic, it’s got to be the right traffic. And the good news is, you don’t need to spend a large amount of money to do this. Content marketing is the key to attracting the right kind of traffic to your website, traffic that actually converts. That will give you the core that you can then leverage if you want to do paid advertising, or start cold traffic into funnels. That’s great. But build around a core content hub, and you’ve got a great recipe for a strong business. I like to create businesses that are sustainable, so if you want a sustainable business, content marketing will help you a lot. Think of it as like building up momentum in a flywheel. You spin it a little bit in the beginning, it’s a little bit slower to get going, but it has such staying power. You could literally take time off your business and your content’s still working for you. With hundreds of posts or episodes for podcasts out there, they’re leveraging for you. The advantages of this: it’s relatively easy. With a well-trained team, or even by yourself, you need only make an audio recording and pass it on to the team for editing, illustrating, transcribing and publishing. It sounds like a lot of work, but actually a very small team does that in my business. And in the beginning, as per small businesses, it was me. And audios don’t have to be long. This show is a great example of that. I often do 7-, 10-, 11-minute podcasts, and they’re just as popular as a one-hour podcast. You don’t even need a guest. All you need to do is to come up with some ideas, put it into a useful format, and then share that with the rest of the world. And ideally, it will target your specific audience, people who it’s going to resonate with. The reason it’s sustainable is because it’s so easy. You can keep it up over the long term, turning out a piece of content two or three times a week, or perhaps more if you’re very enthusiastic. That will get you a decent business. The reality is, in my business, I’m publishing about three posts a week, and those posts are enough to drive millions of dollars in sales, just because I’ve built up momentum, and I continue to maintain and sustain. Now, if you could produce two or three pieces of content that were 10 minutes or less per week, you really could maintain a decent business. It has to be good content, though. Ideally, it’s evergreen content, so that it’s not just relevant today but it’s also relevant next year or the year after. Take this topic, for example. Content marketing is still going to be important next month and next year. So this very podcast could still be used next year as part of a sales funnel. With the right kind of content, that is, content that is always relevant, you can publish once and have it continue to attract and convert readers and listeners for months, even years to come. It’s also very efficient. Once you get into the routine of creating and posting content, the process is like clockwork. And after the initial effort of creating and publishing, you simply wait for visitors to consume and respond. You’ll see comments and interaction on your site, and in the iTunes and the Stitcher platforms. You’ll also be able to share your content on social media platforms like Facebook and Twitter. And a lot of those will actually get reposted and retweeted and shared, if your content hits the mark. It’s very cost-effective, because technology has made content creation virtually cost-free. For an affordable amount, you can just employ a very small team or sub-contractors to help you process the content that drives your sales. Now I’m going to talk about the individual team roles that you might look to hire in your business or you might subcontract this type of job to a team like mine or individual contractors, which you might find from Jobs Board, or an outsourcing site like Fiverr. I have actually decided to employ these people on full-time contracts, because I have an ongoing need, because my business is sustainable. But my marketing team, or my publishing team’s wages is pretty much my main marketing cost for my business. So overall, for the amount of revenue we generate, our cost is very, very small to produce our sales. Let’s talk about the roles that are important. And remember, you might be doing these roles yourself in the beginning, but as soon as you can practically afford it, have someone else do it. I do suggest a video or audio editor if you are making video or audio content. Because after you’ve recorded the content, there’s no better feeling than dragging that file into Dropbox and knowing that someone else is going to listen to it back, cut out all the ums and ahs, put a nice introduction and outro, and label the file accordingly and load it to its final destination. So a video and audio editor will save you an enormous amount of time. Firstly, it will save you at least the same amount of time that it takes you to record any piece of content. For example, if you were to record a one-hour audio, you’ve now saved one hour of listening back to that audio. So I think these are some of the most significant steps from my content progression, is when I got someone else to edit my videos, and someone else to edit my audios. Now it’s good if you can find someone who has some writing skills, because that person can listen to the audio or video and create bullet points, and write sales copy and do transcriptions. These allow your video or audio content to be leveraged into the text format, and I highly recommend you do this for a few reasons. One, it’s very easy for people to read if they don’t like listening to audio or video. And there’s still a whole generation of people who just prefer to read. Two, it gives you fantastic opportunities to provide a content upgrade, where people can actually submit their email address in exchange for a PDF transcription of your podcast or your video. And this gets phenomenally high opt-in rates. Typically in excess of 85% of people who click on the button to get access to the transcription will leave their email address in exchange for that. And that contributes to me building my email list, and you can do the same thing on your website. If you combine this with LeadBoxes, then you’ll have a very simple, replicable system for opt-in capture that’s highly segmented, super targeted so they get the right buyers. Also within the transcriptions, which I like to think of as a Trojan Horse, you can put a call to action and text links to your best products and services. Ideally you can have a designer on team. I think design is underestimated by most marketers. Design is so important, and if you can have an in-house designer they can translate your ideas and visions into pictures. But if you can’t, then supply original photos with your iPhone or with your DSLR camera, because original photographs are better than stock images. The last thing you want on your website are stock images, if you can possibly avoid it. So go for original art. If you can have a designer illustrate your posts, fantastic, because that’s going to leverage other medium like infographics, which you’ll see plenty of here on SuperFastBusiness.com. Our designers just go through, listen to the transcripts, get the bullets from it, and then they make it into a visual masterpiece. If you need someone to do that, our team can actually supply these for you. A project manager to communicate your instructions and present things for approval and to monitor output. This is really important. This is pretty much the role that my virtual assistant does. That is to pull together everyone in the publishing team and to coordinate with me the publishing schedule. My virtual assistant will actually let me know when we need more content to publish, and my virtual assistant will also advise the team what’s coming down the pipeline, and moderate the publishing speed, give me a traffic light indicator of how busy we are. Everything from green, meaning that we’ve got plenty of capacity to do more, through to orange where we’re getting pretty close to the limit, and red, where we’ve got far too much content to process. And using the traffic light system, with my virtual assistant, we can easily keep our content rolling. Now when you consider that I have a number of different podcasts, and I also have the main blog here on SuperFastBusiness.com, our small team have a very high capacity to output, because we’re all dedicated to the standard operating procedure, and things run smoothly. Now it’s also handy if you have a webmaster to look after your site. This will be someone who manages your hosting, your website speed, how your site looks on a mobile phone, and that they can also coordinate with the publishing team to make sure that opt-ins and sales offers and shopping carts and SSL security certification and all of these things are in place, and that your site is error-free with Google webmaster tools, and that they keep track of how many indexed pages are being indexed, and that your search engine features on the site are all appropriately looked after. For example, keeping your image sizes small, keeping your audio and media video hosted away from the site to keep your load times fast, and to constantly work with heat maps and conversion testing to get your opt-ins and your sales process as smooth as possible. Now, you might also have a tech wiz somewhere in your business if you’re doing a lot of cart functions, and if you want to integrate funnels and tags and automation and emails and sequences and CRM, then a cart wiz who is good at tech but understands marketing can be fantastic. On our site, our whole Buy With Bonus recommended products affiliated business is run by a person who can understand sales copy, right through to hooking up the bonus delivery memberships and integrating all of the content that we make from our live events into our paid membership community. So that’s pretty much the types of roles you might consider, so here are some tips on leveraging your content even more. If you want to sell more of a particular product or service, highlight it in your content. So for example, if you sell website services, and you find out that Google will no longer be listing non-mobile-friendly sites in the mobile search results, then you would want to publish content relating to that. You would want to put an infographic or an article on that and let people know about this with a clear call to action to the service that solves the problem. Another thing you should do is keep track of your numbers. This will help you monitor how effective your content marketing is, and what to measure. Some of the things I look at in my business, and you might want to make a list of in your own business would be: the opt-in rate – how many people actually subscribe to receive regular updates from your content? How many emails do you send per month from your broadcast system? I know we read a lot of emails, but how many do you send? Because the two types of marketers are the ones who read emails, and send emails. And if you’re the one sending emails, you will actually make more money. You’ll sell more, if you have more calls to action, if you have more broadcasts. So I actually track how many emails I send per month. There’ll be a big difference in sales if I send 50,000 emails versus if I send 200,000 emails per month. I want to know how many unique visits I get to my site over the last 30 days compared to a few months ago, and I keep track of that, because that’s an indication of market reach. If you have a podcast, have a look at the number of weekly downloads for your podcast. I use Blubrry stats for this, but any number of systems can track this for you. It’s a good indicator. For example, if I’m getting 15,000 podcast downloads per week, then I know that my content schedule is on track. If I’m getting 10,000, then I should probably publish more episodes. And I’ll also look at my sales numbers. Of course, that’s what it’s all about, is the amount of revenue that you can generate subtracting all of your costs equals profit. So I do look at my profit on a monthly basis. Have a retargeting cookie on your website so that you can follow up people who visited your shopping cart page but didn’t buy. This is a simple way to leverage that marketing funnel. So think about this. Someone listens to a podcast, visits your site, finds out that there’s this article that talks about a big problem in the marketplace, then they click on the solution but they don’t buy, that’s the person that you want to follow up. Combine your content marketing with social media and paid campaigns just to amplify what you’re doing. Syndicate your post, that means share your post to Facebook, Twitter, Pinterest, Google+, and/or LinkedIn, if you’re a business to business market, and then you can even run ads to those syndicated posts. This will create a great funnel for people to come back to your website. Feature real-life stories and documentaries. Case studies are very powerful ways to engage your audience. If you can have real users talking about their story that is super compelling, that’s pretty much the primary method I use to generate sales for my live event. And the content marketing support that was interviewing these speakers who were going to be presenting at the event and then talking to some of the previous attendees about what they got from the event, why they visit the event, and who else might get some value from it. Aim for quality rather than volume. If you’ve got a choice, you’d rather have less content but better content than having a lot of content but low-grade content. Sites like Google are very good at working out what quality content is. Quality content gets shared, quality content has more time on the page, quality content turns into sales. Good quality is what makes people hang around, opt in and eventually become customers. So create content that’s relevant and that targets the pressing challenges of your audience. This podcast is an example. It’s not the world’s longest podcast. There’s podcasts out there who have two- or three-hour episodes. But when you listen to it, you have to sift out all the rubbish and the filler and the fluff. What I like to do is just put the concentrate and let my buyers find themselves through the calls to action. So there you go. This is why content marketing is a powerful traffic strategy. I hope you’ve enjoyed this podcast. If you have, please share it with someone, perhaps leave a comment on iTunes. I’m James Schramko, and I’d love to help you grow your business faster inside SuperFastBusiness.com/membership. I’ll see you there. Talk about it: How can you improve your content marketing efforts? Your point about not more but better is a big one for me… I can see how the belief of “I need to produce a lot of content for it to be valuable enough” has been a mental hurdle and actually gets in the way of taking action. Rather than just focusing on the effect the information can produce for people by being delivered concisely. Personally I prefer short & punchy podcasts (like yours and Conversion Cast) over long & winded (like most others)! Amen brother. Great post and great topic. I admit I struggle to turn off when there always seems to be ‘one more thing to do’. A-Z you covered it all.. excellent. Another great piece of gold class information. Your content is so valuable and I love how you just get straight to the point. Thanks James.